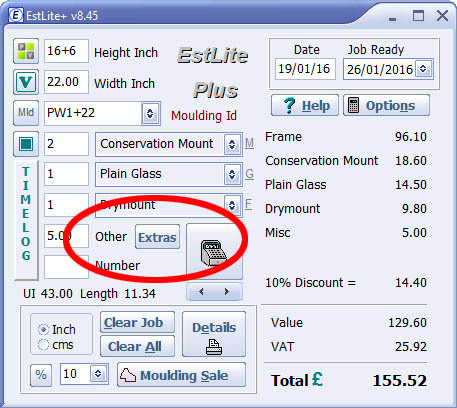 EstLite can be configured to select an item (such as print, photograph, or other items such as easels etc) from a list and include it in the current framing job. Create a list of items in a spreadsheet program such as Excel then save it as a comma delimited (CSV) file. It must be named OTHERTABLE.CSV. The table should have no column headers. In other words, the first row of the spreadsheet should contain the first item of the list together with its selling price. To Incorporate this feature into EstLite, drag the file OTHERTABLE.CSV on to the main page of EstLite. After dragging the file the List button appears on the main EstLite screen. Clicking List brings up this dialog where an item may be selected.